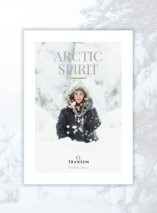 Transun is an independent, specialist tour operator. We operate travel experiences to interesting destinations all over the world, but especially in northern Europe. We’re based in offices in Oxford, although we’ve also had premises in London and in the North of England in recent years. We’ve been in the travel business for nearly thirty five years – and not many companies can say that. We’ve operated to a wide range of destinations in that time and have built up heaps of experience at designing and delivering specialist holidays for our loyal clients from all over the UK. We aim to give you the best service possible, from your first enquiry through to your time on holiday. The main focus of our current programmes is the Arctic region of Scandinavia where you can visit Santa in Lapland or witness the spectacular northern lights inside the arctic circle in northernmost Finland and Sweden. These regions also play host to a range of other experiences including husky safaris, snowmobile expeditions, traditional excursions by reindeer sleigh and nights in an igloo. Throughout our history our guests have travelled with us to a range of destinations across Europe and we have long had a reputation for quality holidays in Croatia. We have also operated long haul programmes to Thailand and the Far East and to the Seychelles. We’ll advertise new and returning destinations on this website as they become available. Transun are proud to offer the widest selection of departure airports from the UK to Lapland - more than any other operator. Our direct charter service, exclusive to Transun, operates to Enontekio Airport in the far north of Finland. 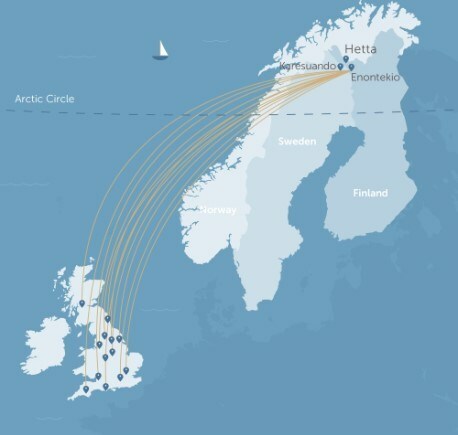 We fly from 20 UK airports, making it easier for you to reach Lapland from your local airport. Amid the forests and fells of Northern Finland, you can experience the Arctic Circle at its unspoiled best. Here, on the edge of Europe's last wilderness, is a land of amazing natural phenomena. In winter, you can witness the Northern Lights, nature's most memorable spectacle, while enjoying exhilarating activities like 'mushing' a husky sled or driving your own snowmobile across the Arctic tundra. Or perhaps try your hand at cross country skiing or snowshoeing, the age-old traditional methods of exploring the stunning Arctic terrain. You may also be interested in ourholidays to Norway and holidays to Sweden. 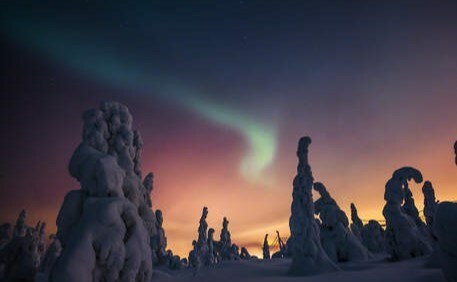 Far away from the concrete ski hotels and glaring commercialism of mass market winter resorts, true Lapland is a land of tranquility, stunning natural beauty and warm and welcoming communities. The region perches on the edge of a vast wilderness that has nurtured the nomadic Sami people for generations and is just waiting for you to explore. We offer holidays to see Father Christmas in his authentic home, a land of legends and magic, heading out into the frozen forests by snowmobile, husky sled or reindeer sleigh. 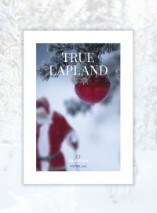 You can explore our full selection of Santa trips or our wider range of Finland holidays. All holidays that you book with us our ATOL protected. We are licensed by the Civil Aviation Authority, so your holiday and the money you pay us are safeguarded. We are an ABTA tour operator, which means that we’ve signed up to a Code of Conduct governing our business practices, so that you can book with us with complete confidence. Our dedicated team is on hand to use their first-hand experience to help you select an Arctic holiday to suit your needs and requirements. I would like to take this opportunity to thank Transun for a truly magical experience. We travelled on the Heavenly Peace Tour. This was a return trip for us having previously visited with Transun in 2014, this year we stayed in a cabin. We travelled with a party of six, four adults aged 42 - 71 and two children aged 7 and 8. We all had a fantastic time and enjoyed each and every experience. Santa and his Elves and reindeer were amazing as were the snowmobiles and huskies. We were greeted at the airport by the Transun & Santa Safari Team who were friendly and energetic and looked after us from start to finish. The setting and location of the hotel is beautiful, a picture postcard. The hotel is in a fabulous isolated location and although basic this adds to the authenticity and magic of this experience. We were well fed with good, warm, filling food and staff at the hotel worked hard to try to meet everybody's needs. I have read some poor reviews of the hotel and experience on TripAdvisor and wanted to express our view that this was an amazing adventure that we will love and treasure forever. We made lifelong memories playing in the snow and exploring the beautiful forests and scenery. I would love to come back again one day - maybe on another Arctic adventure. Please pass on my thanks to all the staff - from reservation through to reps, hotel and the staff who made the excursions and the experiences so magical. Thank You! From start to finish, this was a relaxing magical trip. We weren't overloaded with excursions, and had plenty of free time to have fun in the snow. The excursions were all fantastic, with plenty to do while waiting. Staff were great and this really was a trip of a lifetime. 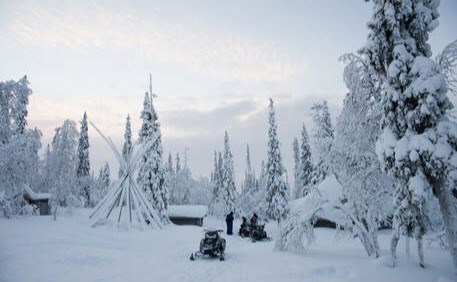 My wife's and my priority was to see the Northern Lights (which we did though not on the organised excursion to do so) but we also loved the idea of the inclusive trips, such as the sleigh ride (good), dog sledding (awesome), snow-shoe trek (brilliant) and the snowmobiles (harder and bumpier than it looks). From the moment we arrived, we were looked after attentively by an international cast of employees, all of which were unfailingly helpful and polite. The food was plentiful if not a little basic, but very wholesome.The hotel rooms were plain, but warm and reasonably comfortable. The excursions were well organised by an enthusiastic and knowledgeable crew and the various transportation was always on time. The loaned snow-suits and boots did their job well! Great fun, awesome experiences, wonderful setting, good value for money and highly recommended. I have recommended it to all of my work colleagues and we will almost certainly return with other family members in the future. We had a fabulous time staying at The Davvi Arctic Lodge in one of the cabins. All the staff at the Davvi were very helpful and cheery. The staff allocating snow suits and boots were so helpful and made sure we were happy with the outfits, which were incredibly useful and good at keeping us warm and dry. The restaurant food was good and plentiful and the ambience in the restaurant was lovely. Our cabin was good and very cosy, so cosy we had to turn the heating off (the weather was mild -5 when we were there!). We loved the husky sledging - such fun with a wonderful chap who owns the huskies. The reindeer are beautiful and the night time sleigh ride through the forest was magical (just lacked the stars that night!) Visited the IceHotel, not our type of hotel, but very interesting to visit plus a lovely lunch in their restaurant before heading home. Definitely recommend this holiday (even though we only caught a glimpse of a green haze which I'm told was the Northern Lights). We'll just have to visit again! Definitely an enjoyable experience; absolutely nothing wrong with it at all. Hotel is on the basic side but it is very comfortable with friendly staff and plenty of food - you won't go hungry! Snowmobiling was superb and dog-sledding was a real hands-on experience. Meeting people was very easy, lots of guests and socialising in the evenings. Overall, I really enjoyed myself and it was a different kind of holiday experience, so well worth the money. We packed in a great deal of enjoyable activities and even though we didn't see the Northern Lights, it didn't seem to matter as everything else was so good. 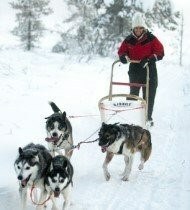 We will never forget the early morning howling of the husky dogs as they eagerly waited to get going, pulling our sleds. All the guides were friendly and knowledgeable and helped to make it a really exciting experience of a lifetime. Had one of the best holidays ever. Well organised, staff very helpful. Food excellent and plenty of it. The hotel and lodges are basic but very functional when you think that you are coming and going in snowy gear. We had a ball. A thoroughly enjoyable holiday. We have already recommended this to other family and friends. The hotel was warm and comfortable; staff friendly. Excursions were excellent; and we were lucky enough to witness the Northern Lights on a night when they weren't expected to appear! A holiday which was nothing like we had ever had before...and totally brilliant. We were probably lucky with the weather as it was quite mild (which meant snow) but it also cleared enough to see the Northern Lights. We thought we would have some time on our hands but the whole break was packed, the planned excursions were filled in with a walk over the frozen river to Sweden (church, museum and hot chocolate), tobogganing down the hill and walks up the hill. The lodges were fantastic, comfy and very warm. We even splashed out on the hot tub (with chocs and sparkling wine). The planned excursions were very well organised and the staff were lovely. We shall never forget the huskies, the reindeer, snow-shoeing and, best of all, snowmobiling to go ice fishing (I didn't even catch anything but my wife did). Great holiday, not cheap, but such a great experience.